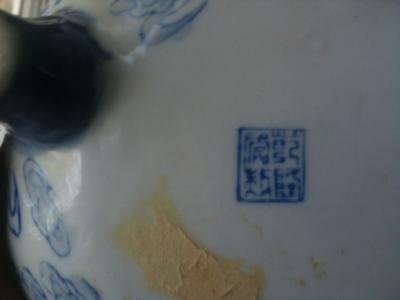 I picked up a piece yesterday at a thrift store that I believe is Chinese. I thought it was interesting so did a little research and found your website. I am interested in learning more about the piece if possible. 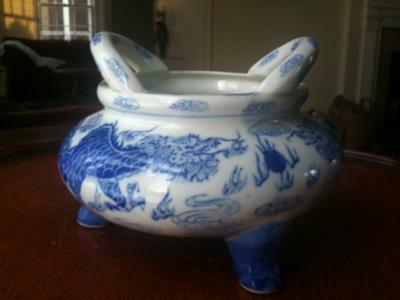 I don't have any illusions of great value (read your note about liklihood of finding ancient chinese porcelain at thrift store is like winning lottery). Anyway, I liked the piece and thought it was interesting for a number of reasons. 1) The placement of the handles with respect to feet is asymmetrical. 2) Placement of 2 large dragons to handles is assymmetrical. 3) Liked the vibrant color of dragons along side the muted cloud detail. 4) The outside is painted in nice detail but the inside is a mess! 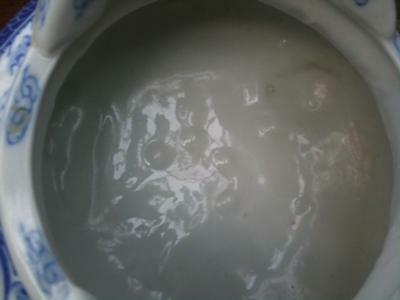 It has large bubbles in the center, big dips where the feet are placed, glaze drip marks, etc. I looked at your section on age evidence. I do see a few brown specs on the pice in various places. Also, I do see some small glaze contractions or small holes, mostly noticeable on the bottom of the piece (maybe because there is no decoration). There is no crackling on this piece. Does have a nice "ring" when I tap it. I was wondering if you could tell me anything about the piece. 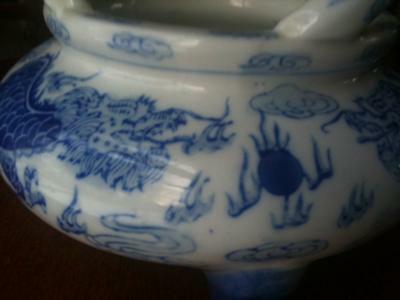 Particularly interested to know if you think it is antique/modern, info about marking and what the round orb-like object with the tentacle things is between the 2 dragons. This is a 20th century item, probably second half. It is printed, not handpainted. No antique, I'm afraid. The reign mark is only for decoration.